In this sixth-grade humanities lesson, students prepare Steamed Dumplings as they study the exchange of ideas, goods, and foods between China and other regions during the Han dynasty. This is the first of four Silk Road lessons. Cite examples of China’s contributions to the Silk Road. Identify geographic features that isolated China before the Han Dynasty. Explain why certain items were valuable for trade along the Silk Road. 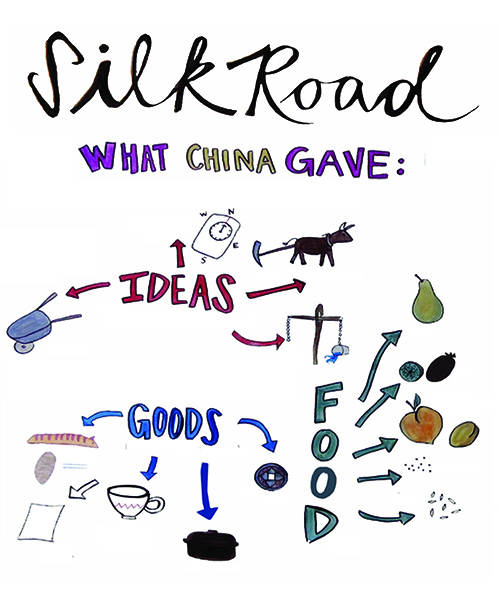 Name ideas, goods, and foods from China that were traded along the Silk Road. Name a geographic feature that isolated China before the Han Dynasty. Copy the Steamed Dumplings recipe to hand out. Copy the Dipping Sauce recipe to hand out. Press the tofu to remove excess moisture. Welcome students back to the kitchen. Introduce the Silk Road series and today's lesson. Today we are starting a four-lesson series in which we’ll be talking about the Silk Road. Could someone help us out—what do I mean when I say the "Silk Road"? What do you know about the Silk Road already? The Silk Road was an ancient trading route that stretched 4,000 miles, all the way from China to Rome. It started more than 2,000 years ago, and lasted for almost 1,000 years. It existed in a time before trains, planes, cars, phones, computers, and email, so the goods, religions, ideas, and food traded along the Silk Road were all carried by foot or animal. Over the next four lessons, we’ll be traveling along the Silk Road—from China to northern India, to Rome—and cooking foods that originated in each of those regions. Today I'm going to tell you a story about how the Silk Road started in China. Part of this story is also how the dumpling made it to China—because believe it or not, the dumpling was not always. The beginning of our story takes us back 2,000 years ago, to around 150 BC in Imperial China. Tell the story of how the Silk Road began in China. This story involves three groups of people—the Chinese, Xiongnu, and Yuezhi—and begins more than 2,000 years ago, in 198 BC. Back at this time, the Chinese Empire was geographically isolated by the Pacific Ocean to the east, the Himalayan, Kunlun, and Karakoram mountains to the west, and the Taklimakan and Gobi deserts to the northwest. The Chinese only had extensive contact with one group: the Xiongnu (now known as the Huns). The Chinese and Xiongnu had territorial conflicts in modern-day northern China. In 198 BC, Chinese Emperor Gaozu gave his daughter to the Xiongnu and began to pay an annual gift in gold and silk to make a treaty. But the treaty wasn't honored and the attacks on the northern border continued. The Chinese launched an attack on the Xiongnu but lost miserably. In 138 BC, Emperor Wudi sent Zhang Qian and an envoy of 100 men to try to make an alliance with the Yuezhi people. They got captured by the Xiongnu and were held for 10 years, but eventually escaped and made it to northern India, where they found the Yuezhi. The Yuezhi (now the Kushan) refused to ally with the Chinese against the Xiongnu. They were not interested in revenge and had become trading people. They wanted to maintain peace. On their way back to China, Zhang Qian and his men saw “heavenly horses” native to Central Asia. They wanted to obtain these horses because they believed that these huge horses would strengthen their army so that they could face the Xiongnu. What were some items the Chinese might have traded for these horses? They exchanged a variety of goods for the horses (silk was the most valuable and sought-after), built up their army, and eventually secured their northern border, ensuring safe passage along the Gansu Corridor for continued trade—this was the beginning of the Silk Road. Dumplings were originally a food developed by the Xiongnu and other nomadic people of Central Asia. Their importance in Chinese culture is evidence of the cultural exchanges that occurred even between peoples at war. Today we are making a Chinese version of the dumpling, with tofu, vegetables, soy sauce, and hoisin sauce. Next lesson we’ll be continuing this story, moving west to northern India, and looking at the history of the Silk Road there. Wash your hands and split up into your table groups. Small-group check-in: What is your favorite food to eat that is wrapped, or that has an inside and an outside (e.g., dumplings, empanadas, ravioli, enchiladas, pork buns)? Explain that class will happen in two parts: First we'll prepare the dumpling filling, then we'll come back together to clear the table and wrap the dumplings. Introduce the filling jobs and emphasize that all the ingredients should be cut, grated, or minced into very small pieces. Divide students into cooking jobs. Students reflect on the recipe and the lesson. If there is time, ask students what item from China they would be most excited to trade for on the Silk Road. Narrative-style Chef Meeting: We treat this Chef Meeting like a story. We find that presenting the information in a narrative style engages the students deeply in Silk Road history and sets them up well to be curious about "what comes next" for their next three lessons. It differs from most of our other Chef Meetings in that there is a greater amount of teacher talk time and we don't emphasize direct student participation as much. Dramatic, engaging storytelling is very important to make this lesson a success—but when it is, it often has the students on the edges of their seats in rapt attention the way only a good story can. Two-part lesson: We teach the cooking portion of this lesson in two parts. First, all the students work on preparing the filling. Then we clear off the table, demonstrate how to wrap a dumpling, and everyone wraps the dumplings together. When we're introducing the jobs, we explain that the first part of the lesson (making the filling) should happen fairly quickly so that we have enough time to wrap, cook, and eat the dumplings. Shredding the cabbage: We like to shred the cabbage ahead of time for our students. We have found that it is difficult for them to shred it finely enough to cook fully in the short time it takes the dumplings to cook. Flexible recipe: The filling in this recipe is quite flexible. Add more vegetables if you need more work or eliminate some if you need less. We often add one or two cloves of garlic because it's a delicious addition and students love to practice mincing. Dumpling skins: We buy our dumpling skins premade (often found in the freezer section or next to the tofu). We like to get a combination of square and round skins because students like to experiment with both shapes. If you make the skins from scratch, note that the dough needs to rest 30 minutes to two hours, or in the fridge overnight. Rolling the skins thin enough for steaming can be challenging. Ginger: The ginger should be prepared in very small pieces. If mincing, show students how to peel the ginger with a spoon. If using a microplane grater, there's no need to peel before grating. Tasting the Dipping Sauce: Some of our students discovered that when they were tasting the Dipping Sauce, the sesame oil coated their fingers or spoons so that it was all they could taste. All the flavors will be present when served with the dumplings. Seasoning the filling: We put the soy sauce, hoisin sauce, sesame oil, salt, and pepper on a separate table (the Spice Table in our Kitchen Classroom) so that students can have convenient access to measure all these ingredients. We highlight these ingredients on a copy of the recipe and hang it above the Spice Table so students can be independent. Setting the table up to wrap the dumplings: We have three groups of 8 to 12 students in our kitchen classes. Each group has its own table. To set up the tables for wrapping the dumplings, each table gets: two or three bowls of prepared filling with 8 to 12 spoons distributed evenly between the filling bowls; three small bowls filled with an inch of so of water; a pile of spinach at each end of the table; a steamer basket at each end of the table. Setting the table up this way means everyone can reach what they need to wrap dumplings. Steaming with spinach: We layer the bottom of the bamboo steamers with spinach before putting in the raw dumplings to prevent sticking and tears. Who has made dumplings before? When we demonstrate how to wrap a dumpling, we always ask this question in order to acknowledge the experience and expertise many of our students bring to this lesson. Dumplings are a culturally significant food for many students, and many are able to share cultural variations on the recipe that we use. We explicitly name that there are a million ways to make a dumpling and that the way we are doing it in class is just one. Dumpling overfill: This is essentially the only pitfall. Don't put too much filling in or the dumpling won't close! Cornstarch: The cornstarch coating on the store-bought dumpling skins keeps the skins separate when dry, but makes them stick when wet. Our students often find this paradox amusing. Creative dumpling wrapping: Emphasize that there is no one way to wrap a dumpling. Encourage students to investigate how many ways they can find to wrap theirs, and encourage them to learn from one another. Collective dumpling wealth: We make sure to explicitly state that students will not necessarily be eating the dumplings that they personally wrap. Extra filling: Serve any filling you don't use as a raw side to the cooked dumplings. Cooking the dumplings: Dumplings can be boiled, pan-fried, or steamed. If steaming, you can use any kind of steamer (bamboo or metal). We use bamboo steamers. In order to cook the dumplings evenly we rotate the trays from top to bottom while cooking. Extra dumplings and skins: Dumplings and dumpling skins freeze really well. Chili oil: We eat our dumplings with Dipping Sauce made by the students and chili oil that we make ahead of time (find a recipe here). Eating with chopsticks: Not everyone at the table will know how to use chopsticks. Sometimes this causes anxiety or embarrassment. Sometimes it leads students to deride or mock chopsticks as eating utensils. Preempt this by encouraging students who know how to use chopsticks to teach students who don't. Etiquette and norms around chopsticks use: Invite students to share the etiquette or norms they have or know of around chopsticks. Chopstick challenge: If you have extra time, it can be fun to put a variety of small items (beans, leaves, and other trinkets) on a plate and time how quickly students can move all the items from one plate to another. Chopstick drumming: We always ask students not to drum with chopsticks because it is loud and can feel disrespectful for those for whom chopsticks are a standard eating utensil. Dessert dumpling challenge: A fun challenge for conversation at the table is to prompt students to imagine delicious dessert dumpling recipes. Meat dumplings: Replace pork with tofu and knead the pork with some salt first. Explain the geographic features of China that made governance and the spread of ideas and goods difficult and served to isolate the country from the rest of the world.